Southern Matriarch: A Little Horn Tootin!!! Classic Sewing Magazine published by Hoffman Media. Well in the midst of a greater than average stressful week a sweet surprise arrived in my mailbox. My advance copy. Squee! See, I CAN keep a secret! Excuse my fly-by phone pics but I was a tad excited here people! 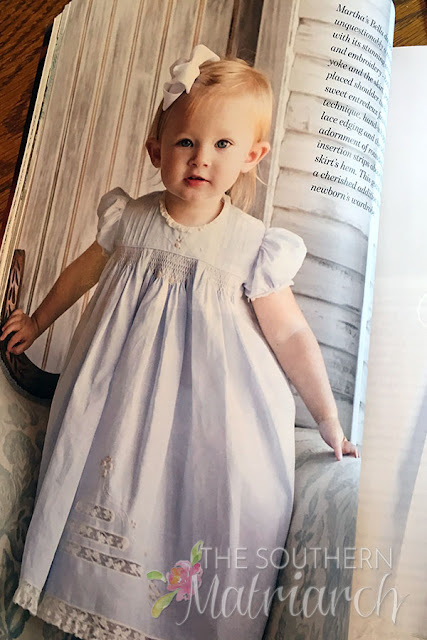 I don't know who this sweet little model is but she is a cutie patootie! And it goes to show just how a baby grows UP and not OUT! 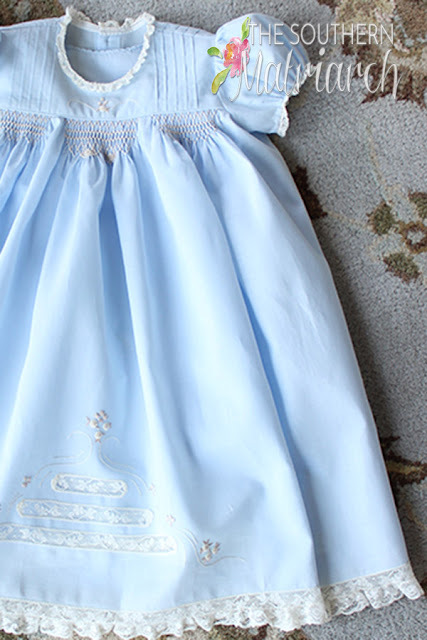 This little day gown fits quite a while. I have friends who have had many, many items published so perhaps they are more accustomed to seeing their things in print. Not me, I still get a real charge out of it. And seven pages! That was a real surprise too. I have a few photos I had taken before I mailed it off. I don't want to share too many details because I want you to purchase the magazine! We need to do our part to keep any and all sewing publications in print. 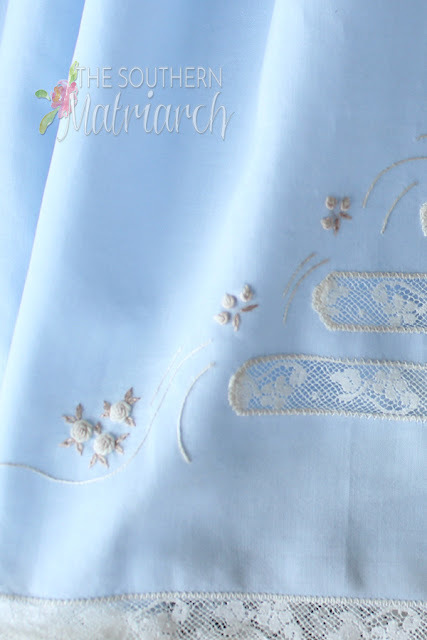 It is an Italian inspired color palette using blue Japanese lawn, smocked and embroidered with ivory and ecru. There is a little bit of lace insertion. The magazine did a stupendous job of illustrating this technique. This photo, you can tell has all the set up of a real professional photographer, HA! Its lying on the floor of my living room in front of the window. I tell all my dirty secrets. You too can be a perfeshenul like me! I hope you will either purchase a single copy, available through the magazine's website, Barnes and Noble or Joann Fabrics or better yet subscribe. You get quite the value for your $. Full size patterns, lots of inspiration through many projects and additional downloads from the website. 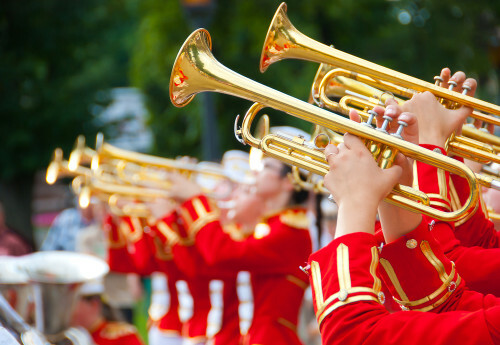 Enjoy and thanks for letting me toot my own horn for a moment. Back to your regularly scheduled programming. Can't wait to see the real deal! Thanks for the sneak peak! Thanks Judy. Its a great issue. It's really gorgeous, Martha!!!!! 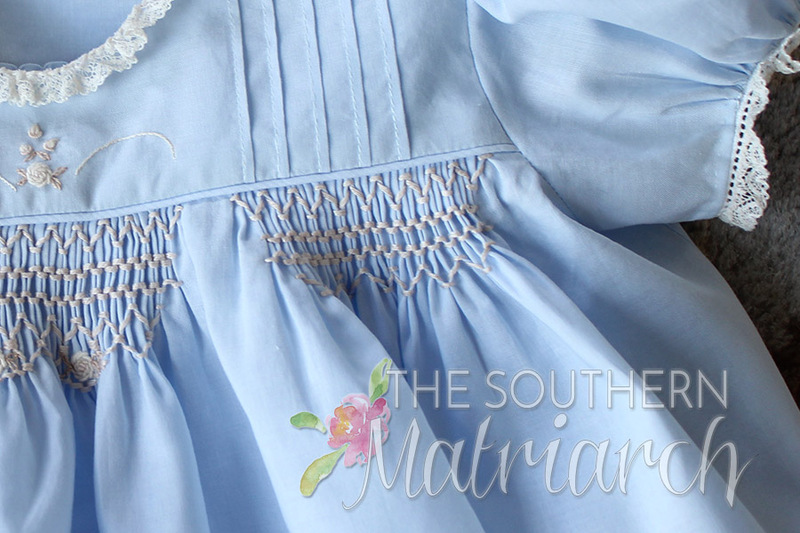 I love all the heirloom details and the "intermittent" smocking design. Oh my word, it is stunning!!! Congratulations! 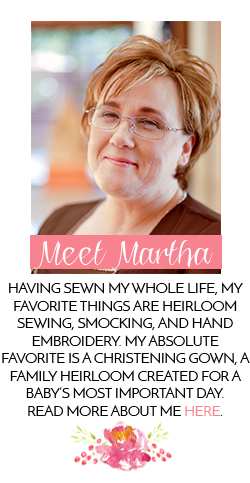 Martha you are amazing! I don't know how you do it. You must sew and design 23 out of 24 hrs a day and if you are in a pinch you add that extra hr. Congratulations on bein published! 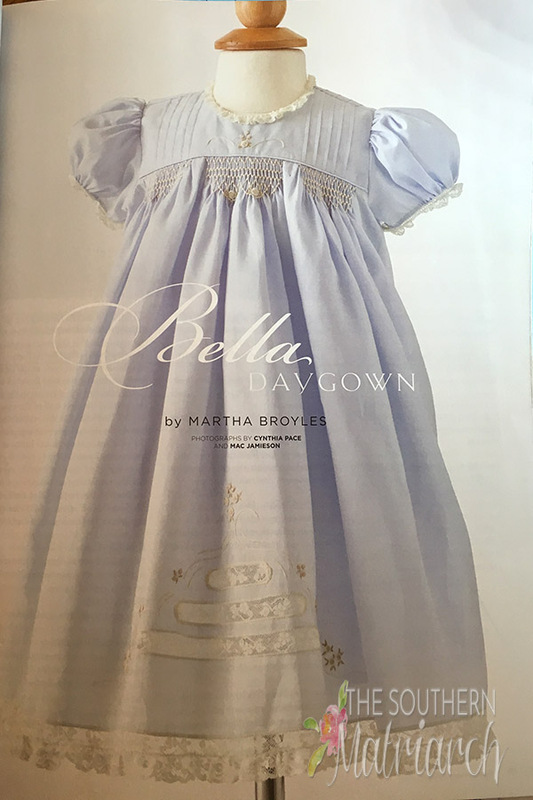 It truly is a lovely dress, and I can't wait to receive my issue. Thanks Cynthia, it is a good issue. Lots of eye candy. Well deserved! Beautiful dress and excellent work! Thank you for sharing.